Ethereum as a new form of blockchain technology tried to revolutionize the world of cryptocurrencies. It wanted to destabilize the conventional financial machinery, a feat Bitcoin initially failed to achieve. The makers of Ethereum, who were part of the Bitcoin revolution as well, believed that only currency was not enough to accomplish this task. These people rather believed in developing a comprehensive system based on a language which will allow them to create complex financial technologies based on a distributed ledger. Such a system will thereby, lead the world towards a decentralized financial sector, which will be free from monopolies, regulations and arbitrary gate-keeping practices. All this, they believed would be leading them to greater financial inclusion. However, Ripple went against the very grain of this idea. In fact, it pitched itself directly against Ethereum rather than any other cryptocurrency or cryptocurrency transaction platform. The Ripple platform works on an ideology that will enable them to create greater financial inclusion not through the elimination of traditional financial institutions but through extending the reach of these very institutions. Ripple community doesn't see its token XRP as an alternate currency but rather as a bridging currency between several popular cryptocurrencies and even between cryptos and fiat. This is why the winner of the "Ripple vs Ethereum" battle is crucial to the future of cryptocurrencies, the blockchain, and alternate financial technologies. The dominance of either of these currencies will decide the course on which the sector is to proceed. Vitalik Buterin, the founder and designer of Ethereum, was convinced that only through the development of a system where people would be able to develop and run new decentralized applications over a blockchain, will cryptocurrencies be able to establish themselves as alternate currencies. Thus, the Ethereum platform allows for people to develop different kinds of decentralized applications which can be commercialized through Ether (the token on Ethereum platform). Moreover, another unique feature which makes Ethereum stand out and also expand its reach to all areas of financial and other transactions is the application of smart contracts. Smart contracts are based on these distributed ledger technologies, which are used by most cryptocurrencies or blockchain systems to store the time-stamps or the details of each transaction. Smart contracts are, therefore, cryptographic codes which can execute certain transactions when the conditions encoded in the contracts are fulfilled. These contracts cannot be tampered with, like all other distributed ledgers. It is for this reason the Ethereum technology has been adopted by many new subsidiary financial organizations which has ultimately raised the value of Ether (ETH). Structurally, many experts even deny Ripple to be a cryptocurrency because unlike most of the other currencies, the structure and the technology behind the Ripple platform is very different. It is not based on a distributed ledger technology; instead it uses a single ledger along with several independent servers which continuously keep validating records of transactions. It even doesn't use the proof of work system used by Bitcoin, Ethereum, and other currencies. It instead uses its single public servers to collect information about the validation of several transactions. And the servers’ ownership would depend mainly on the holdings of the Ripple currency, i.e., XRP. Thus, in contrast to the proof of work model, it is known as the proof of stake computing model. As both the platforms operate on very different technologies, the results produced by them are also varied. Ethereum can allow for the creation of new apps, provide a platform for running them, and use decentralized anonymous nodes to keep track of transactions. But this is very time-consuming. Therefore, performing complicated banking operations over a blockchain system takes up a lot of resources. However, the ripple system based on its model of consenting servers can save a lot of time on the transactions. This factor makes Ripple ideal for the international transactions across different foreign currencies. Moreover, Ripple allows formal financial institutions to play a more active role in the cryptocurrency sector. These institutions can use Ripple to increase the efficiency of their services. However, this also bypasses the underlying philosophy of cryptocurrencies which is that of decentralization. By forging alliances with the traditional financial institutions, it makes its community vulnerable to regulation from government and other authorities. However, this also increases its chances of sustaining itself in the face of competition. By allying with the traditional banks and financial companies, Ripple will be capable of increasing its market capitalization. For all these reasons it seems difficult to say whether Ethereum or Ripple has the greater chance of taking over as the king of cryptocurrencies from Bitcoin. Nevertheless, there is one word of caution that must be said. 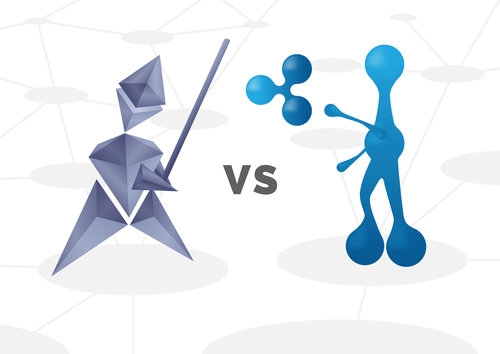 Although, while we compare Ripple and Ethereum as platforms for carrying out financial transactions in the new world, it would be completely wrong to compare the two tokens used in these platforms with equal emphasis. Ether (ETH) is the standard token used on the Ethereum platform. And the token is valued at $521.87 only second to Bitcoin among cryptocurrencies. However, the valuation of Ripple is much lower with much smaller market capitalization. The usability of the Ripple platform has got nothing to do apparently with the value of XRP. To use the Ripple transfer platform, one does not necessarily need to use this currency. In fact, all of the eighteen financial institutions which do use the Ripple platform do not use the Ripple currency according to a report. None of these have even given any statement assuring their plans to use the xRapid liquidity product of the Ripple brand. They mostly rely on the Ripple system for moving fiat across borders and most would avoid using a cryptocurrency in the process. Therefore, from the perspective of an investor, it is however quite clear which of these currencies is more reliable, no matter what may be the case for the future of these platforms. If you wish to buy these exciting currencies and invest wisely to create long term wealth, you can simply use your credit card on the Coinmama platform and buy the cryptocurrencies of your choice. Make a wise decision today and secure your tomorrow.